During your relaxing stay at our cottage, wake up to sunrise over the river and then enjoy your morning coffee on the front porch as you watch osprey and cormorants fish for their breakfast. Then hop on a bike* and take an easy, scenic 3-mile ride along the river and bayside. Or jump in your rented golf cart to tool into town to a quaint shop or family-run restaurant -- no chain stores here! A 10-minute walk or a 2-minute bike ride will bring you into town to the public beach, town fishing pier, visitor's center, marina or museum. Nearby wineries, historic sites and parks provide opportunities for other daytime activities. Nighttime activities range from star-gazing and wine/tapa sampling at The Tide's Market to tiki bar hopping and casino gambling at The Riverboat. If this cottage appeals to you, you may want to also check out our other river-front cottage which is a few blocks away. 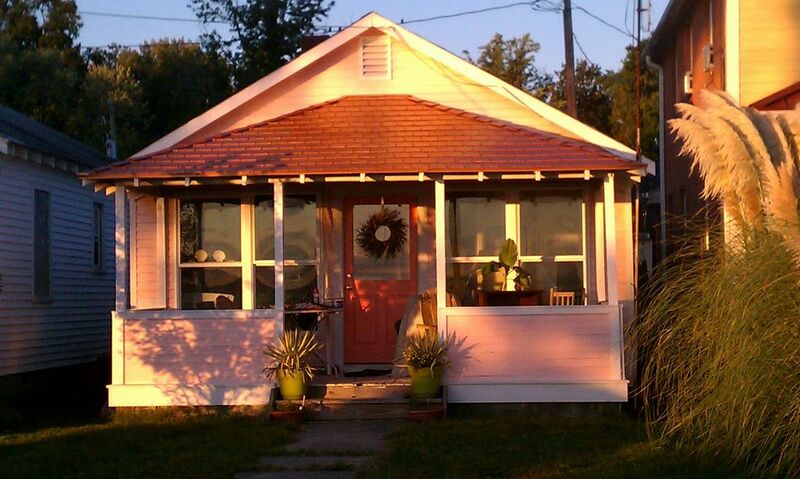 It is called The Sunrise Cottage, property #4013722, and it can accommodate 4 people. My wife and I have spent the last 3 decades getting to know Colonial Beach and growing to love its slower pace and unique charm. Although we have experience with rentals through our work, The Coral Cottage is our first vacation rental home. In 2011, we worked to restore this small cottage, attempting to keep its best features and at the same time opening up its interior by removing some walls and expanding its exterior views and natural light by replacing smaller windows with larger ones. We think the cottage is in an ideal location with it's river frontage and quieter setting... yet convenient to the amenities of the town. We really enjoyed our weekend stay in the cottage. It's on a quiet street by the river, and river and sky views are spectacular. John and Susan are very thoughtful hosts, offering a beautifully decorated and well-stocked space, patient answers to questions, and lots of tips for what to see and where to eat, depending on your interests. Very friendly neighbors are a big plus. We are already planning our next stay. We're pleased that your stay was enjoyable and do hope you will return. Thanks for taking time to write a review. We appreciate it! The Coral Cottage was perfect for our all too short trip. John made communication very easy and was very helpful. The house was very clean and well stocked. John and Susan obviously take a lot of pride in their property and want their guests to be comfortable. We appreciated all the extra touches. We highly recommend! Patricia, we're pleased that you enjoyed your stay at our cottage. We hope that you enjoyed the town as well! Thanks for taking time to write a review. We appreciate you doing it! Yes, our cottage is away from the busiest part of town so it appeals to folks who like a quieter stay. The cottage is one of very few in town that have a full frontal view of the river. Glad you found it peaceful. Recently some of the restaurants have been going through transitions so we're very hopeful that all will be up and running in the spring, if not before! The cottage, as well as the entire town, was nice. Everyone was so friendly and each place we ate was fantastic. John, the owner of the cottage,was very accommodating and very easy to deal with. We will be back! Steve, thanks so much for your review. Visitors to our town are often pleasantly surprised by the friendliness shown to them here. Everybody waves! Come back when you can!! The cottage is lovely, immaculately clean and very quiet. I had a nice, relaxing stay and enjoyed having the use of a bike. Thank you! This cottage is more amazing than the pictures show! The most relaxing quiet spot for a get-away! John is a wonderful host who has supplied everything you could possibly need. Gorgeous views, bikes to enjoy the town, and friendly welcoming people. John has thought of it all and wants you to enjoy the beauty of this cottage and the river. We will definitely come back! Pat, thanks a lot for your generous comments. We look forward to your return.. particularly when the weather is really good! Colonial Beach is a golf-cart community with a retro 1940's/50's feel and beachy look. It appeals to young couples, families, and retired folks who appreciate quaintness and want to avoid the cookie-cutter beach resort scene. It's great for biking and walking within the town, fishing and boating on the river and visiting parks (historic and otherwise) and wineries nearby. Local businesses provide opportunities for shopping (antique/thrift/consignment shops), dining out (restaurants, coffee shop, gourmet markets), and entertainment (tiki bars, gambling casino, special events). We request a stay of 3 nights during peak season holiday and festival weekends. These would include Memorial Day, 4th of July and Labor Day weekends and the Potomac River Festival.